One year ago today, my mama died. My grandma always told me I'd outgrow the first two, that "Mom" was inevitable. Thankfully, she was wrong (as she was wrong about a great many things). I have not, and likely never will, outgrow needing Mommy. A year ago, I lost my mama. My soft spot. The best hugs in the universe. Grief is a funny little thing. Sometimes it is overwhelming. Sometimes it is invisible. And sometimes I'm walking on another planet. Sometimes grief means that I yell and cry at my husband because I can't just say out loud, "Please be extra gentle with me right this minute, before you even say your first words to me today." So, grief lurks and leaps when he says just the wrong thing, through no fault of his own. This past year has shown me a lot about myself. And I have oh so much more to learn. I've learned to nourish myself more. I've learned to text my dad after his nine paragraph posts on social media...just to make sure he's okay. After all, we are grieving together, in our own ways, and we can't let each other go. I've learned that, even though a big part of me wants something bigger in my life, that even though my suburban life sometimes seems so tiny, this life is exactly what I always wanted. And my kids do not care one iota how many followers I have in Instagram...especially if those followers interfere with playing Magnatiles or reading a story at night. And, as it should be, I care way more about my kids than I do about my "brand." Good to know. I have lots of questions that will go unanswered. I'm raising kids without my mama. This hits hard, for a lot of reasons. What should I do when my son has trouble at school? What do I do when my daughter becomes a teenager? I keep praying that her wisdom will trickle down and magically show up in my brain when I'm talking to one of my weeping children. It still remains true that the most important thing she ever did for me was listen, and I'm trying, each and every day to do that. My daughter, after finally finding her voice at 2.5 years old, insists that we all listen,"No, you don't talk now. I TALK NOW." My son interrupts himself every 13 seconds to ensure I'm still listening, "So, the anvelopes were roaming in the fields, Mommy...Mommy...Mommy...and the anvelopes had their new baby anvelopes...Mommy....Mommy." Grief is a funny thing that makes me weak and vulnerable but also keeps motivating me. I'm going to keep listening, to keep spending time with those who matter most, to take time off work. I'm going to drink more sparkling wine. I'm going to laugh at ridiculous things. I'm going to quote my mother (often inside my own head) multiple times per day. I'm going to fight for what's right. I'm going to get angry when I need to. I'm going to do all those things she did. But I'm also going to do what she didn't. I'm going to take care of my body - I'm going to believe that I deserve to be nurtured, nourished, and loved. 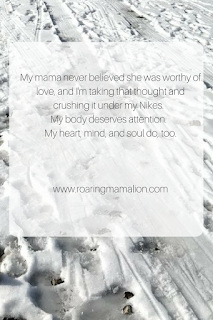 She never believed she was worthy of love, and I'm taking that thought and crushing it under my Nikes. My body deserves attention. My heart, mind, and soul do, too. Grief is a funny thing. We remember the best. We remember the worst. And we act on those memories. So, here we go. Into a brand new year. Beautifully written. Beautiful sharing of your heart. Thank you for letting us in to your life in this way. God bless you and your dad and your family. Grief is indeed a funny thing. Glad you take the time to grieve, to listen, to love and to take care of your own body. Hugs.